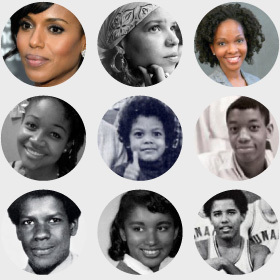 Kerry Washington was born in The Bronx, New York City on January 31, 1977 to mother Valerie, an education professor, and father Earl, a real estate broker. As a young child she took ballet lessons. However, her first real ambition was unlike most. “I wanted to work with Shamu at Sea World,” Washington told Giant. “I thought that was the best job in the world, to care for and feed dancing whales.” After the sixth grade, Kerry left public school and headed to Spence School in Manhattan, a prestigious private school, where she finished off her middle and high school years. Kerry found her true passion of acting playing in many school productions. In addition her many theater credits as a teenager, she was a member of the Tada Theater teen group, which tackled social issues. She graduated from Spence School in 1994. Upon graduating high school, she got accepted into a few ivy league universities, some include Yale University and Dartmouth College. However, she declined both. Instead she went on to George Washington University, where she earned a theater scholarship. Attending the theater program at George Washington University, she created a personalized major called Performance Studies, which allowed her to examine the role performing arts played in a community. During her time there, she worked closely with local theaters and helped create a support system for people of color in the arts called “Shades of the Fine Arts.” She graduated from George Washington University Phi Beta Kappa in 1998. To this day, she is one of the most famous graduates of the Department of Theater and Dance. After graduating, Kerry spent the next three months in India to immerse herself in a foreign culture. During that time, she also touched up her yoga skills. Returning to United States, Washington moved back home with her parents, where she lived while starring in her first feature film, “Our Song” (2000). Though already 22 at the time, Washington convincingly played a wise, but vulnerable, 16-year-old from the Crown Heights projects in Brooklyn. Despite the difference in age, Washington’s obvious and special connection to the character showed, winning raves for her performance which echoed across the film festival circuit. In her first major film, “Save the Last Dance” (2001), Washington gave another breakthrough performance as a street-smart teenage mom who takes in a suburban white girl who has just transferred to an inner-city school. The surprise hit positioned Washington to play meatier roles, as her stock went up in the casting world. For her next notable project, the made-for-cable crime drama, “Lift” (Showtime, 2002), Washington played a petty thief forced to give up her way of life to mend a broken relationship with her mother. Critically acclaimed for her performance, the role ended up earning Washington a 2002 Independent Spirit Award nomination. Coming off such critical acclaim, Washington managed to score big with her winning performance as Della Bea Robinson in director Taylor Hackford’s “Ray” (2004), a biopic about the late, great genius of soul, Ray Charles. Lauded by critics and frequented by audiences, “Ray” eventually won its star, Jamie Foxx, a much-deserved Oscar for Best Actor in a Motion Picture. Washington, too, received kudos for her performance as Charles’ strong and resolute second wife who endured his drug abuse and infidelity. Meanwhile, she received another crack at major exposure when she signed on to play Alicia Masters, the blind love interest of the Thing (Michael Chiklis) in the big screen adaptation of the comic book classic, “The Fantastic Four” (2005). Though the character was originally conceived as a blond-haired, blue-eyed Caucasian woman in the comic books, director Tim Story re-cast the part to accommodate Washington — a move based entirely on her obvious talent. She went on to explore interracial relationships with “Lakeview Terrace” (2008), in which she plays an African-American woman married to a white man (Patrick Wilson). The couple is harassed by an African-American cop (Samuel L. Jackson) in this thriller. With “For Colored Girls” (2010), Washington worked with an impressive ensemble of actresses, including Whoopi Goldberg, Phylicia Rashad, Janet Jackson and Thandie Newton. The film, directed and written by Tyler Perry, was an adaptation of a play by Ntozake Shange. In 2012, Washington moved to the small screen to star on the dramatic political series “Scandal.” She plays Olivia Pope. Pope is a “fixer,” a person who cleans up scandals and other messes for her clients, on the show. The second half of Season 4 of this groundbreaking and loved by millions series returns to ABC January 29th.